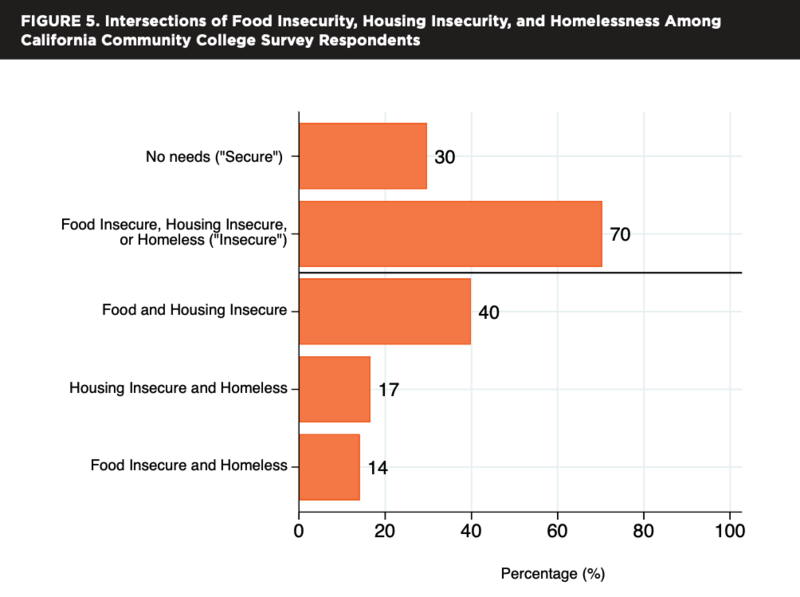 The #RealCollege survey, one of the most comprehensive studies of its kind, was released earlier this month and includes startling information about basic needs insecurity, including food insecurity, for students studying at California Community Colleges. This data was gathered from 57 schools and yielded a 5% response rate resulting in almost 40,000 student respondents. 50% of respondents were food insecure in the prior 30 days. A 2016 study of students at a California state university found that 80% of students who were eligible for CalFresh did not receive benefits. 60% of respondents were housing insecure in the previous year and 19% of respondents were homeless in the previous year. During the 30 days preceding the survey, 20% assessed at the low level of food insecurity, and 30% assessed at the very lowest level of food security. Over half were worried about running out of food or could not afford balanced meals. 41% reduced meal sizes or skipped meals altogether to save money. 12% reported skipping an entire day’s meals because they didn’t have enough money. The region making up Los Angeles and Orange County was the second highest percentage of food insecure students at 54% which is only narrowly better than northern California at 59%. Students who are considered independent from their families for the purposes of filing a FAFSA are more likely to experience food insecurity, while students with children experience higher rates of food insecurity (55%). Two-thirds of students who have been in the foster care system experience food insecurity. College is supposed to be a path forward – a path upward – for many, the path out. Community College students are working hard at a better future and this study provides the evidence. The vast majority (84%) of students who experience food insecurity are employed or looking for work. Similarly, the majority of students who experience housing insecurity or homelessness are employed or looking for work. Also, among working students, those who experience basic needs insecurity work more hours than other students. The Los Angeles Regional Food Bank is currently raising funds to better support the colleges and universities of Los Angeles County. Students with access to nutritious meals are healthier, more focused and more successful. 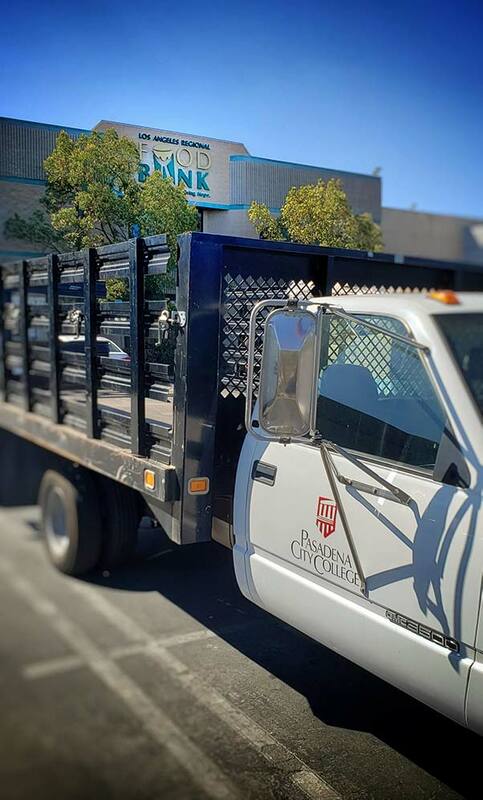 One of the primary ways the Food Bank provides food to community colleges is through our Mobile Food Pantry program, which also serves neighborhoods in Los Angeles County where access to a pantry is limited. Currently, the Food Bank’s Mobile Food Pantry is active at 12 different sites each month, including (but not limited to) community college campuses, totaling 176 distributions in 2018. Last year, the Mobile Food Pantry program distributed almost 1,900,000 pounds of food, including approximately 450,000 pounds of fresh produce. In 2018 alone, the Food Bank also provided more than 100,000 pounds to community colleges who picked up the food and took it back to their campuses. By providing students a little help at this critical time in their lives, we can help push them over the tipping point to success and away from a food insecure future.